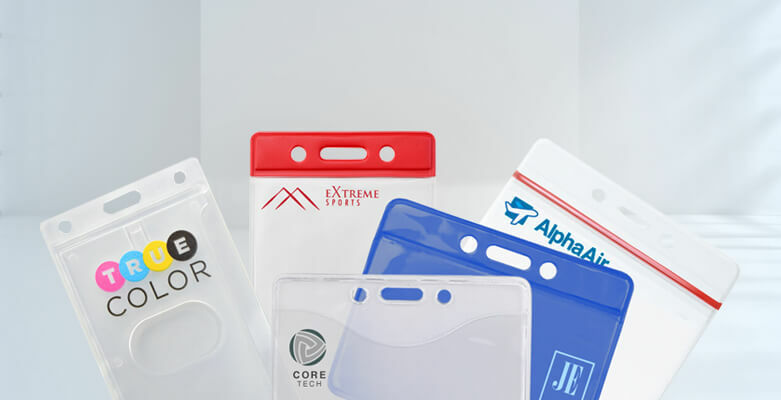 These standard badge holders come in a wide range of styles, designed to efficiently and affordably protect your cards. Locking badge holders are closed once an ID accessory like a lanyard or reel is clipped through the attachment slot so you cannot remove the card, making it harder to accidentally lose the card. These are especially popular for prox cards, since they don’t need to be removed from the holder to be read by the access control panel. If you host conferences, training events, networking events, concerts, sporting events, and more, you can easily print and display large format tickets, press passes, VIP tickets, and more with these oversized and event badge holders. Most badge holders have slots for attaching a lanyard or reel, but if you don’t want to use two ID accessories some holders come with built-in clips and magnetic attachments instead! Not seeing a badge holder that meets your needs in the above list? Check out all our ID badge holders, or order custom-printed badge holders with your business name or logo!